What are the scope, quality, and potential for fundamentally significant results of the proposed research? Do the organizations involved have a demonstrated record of scientific achievement in the relevant science? Is there a clear enunciation of how the research will address the goals of improving the environmental robustness of the Gulf of Mexico and/or the related issues of public health? What is the expertise of the members of the proposed Research Consortium in the relevant research domains? Can the proposed Research Consortium access key personnel and supporting infrastructure to launch their activities in a timely manner? Have the participating Consortium members been chosen appropriately to ensure that the infrastructure (sampling systems, research vessels, analyzers, modeling capability and computational facilities, data management systems, long-term monitoring sites, personnel with substantial local expertise where applicable, etc.) is already in place or able to be lined up in short order to support the planned work? Does the proposed Research Consortium have all the relevant competencies to undertake the work contemplated in this proposal? Will the work be sufficiently integrated across the collaborating institutions to deliver the research objectives? What is the track record of the members of the proposed Research Consortium in the delivery of focused, cooperative research? Has the proposed Research Consortium been effective in recruiting world-class talent into their Consortium of participating researchers? Have faculty members or key researchers been recruited recently, or are positions now contemplated in the participating institutions, to expand expertise in the relevant research domains? What are the scope, quality, and potential for the proposed public education and outreach activities? What is the track record of the members of the Research Consortium in the delivery of public education and outreach activities that are effectively coordinated with professional scientific research activities? Will the governance structure proposed in the Research Consortium support delivery of the GoMRI objectives including adherence to all, provisions specified in the GoMRI MRA. What limitations (e.g., Research Consortium’s policies, rules, or regulations) will affect the operation of the GoMRI as contemplated in this proposal? Is there sufficient administrative support for co-PIs and associated research staff at collaborating institutions, and for coordination with the Research Consortium? Will the research agreement provisions executed with the proposed Research Consortium be able to cascade down to the subgrants for the collaborating institutions to simplify the contract terms and administrative requirements? What is the value of the anticipated research outcomes to advancing knowledge within the major research themes of the GoMRI from a cost-effectiveness perspective? How will the specific research projects undertaken be centralized within the Research Consortium or alternately distributed among various universities or various departments within a university? How will the governance structure maintain the required balance of effort and resources? Is the research timeline realistic and are appropriate facilities available for the duration of the project? Are the overhead charges reasonable for the proposed Research Consortium and for work performed at collaborative institutions? After administrative and merit review, the GoMRI Research Board will make the final selection of funded proposals based on evaluations and recommendations of the peer review panel(s). Decisions regarding allocation of funding will be made by the GoMRI Research Board. 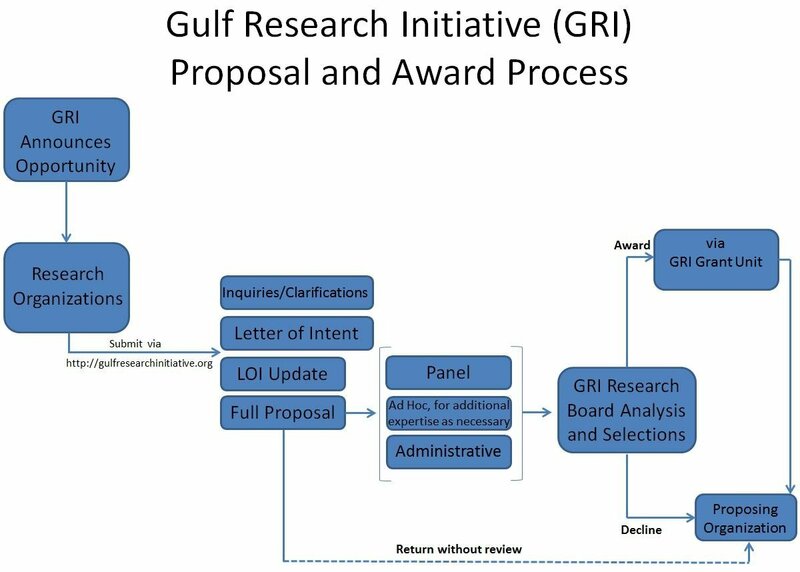 (Click to enlarge) The proposal review and award process illustration.